Mike Hunterbrinker has been rolling recently, first he scored the shootout winner on his first AHL shootout attempt to give the Phantoms a 3-2 victory against Rochester on Saturday, January 19. 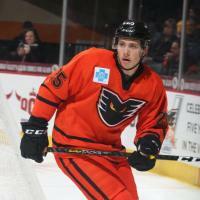 He then potted his first AHL goal as the lone tally for Lehigh Valley in a 2-1 overtime loss in Wilkes-Barre on Monday. Alex Lyon stood on his head to earn the Phantoms two points on Saturday against the Rochester Americans. Lyon faced 51 shots and made 49 saves, both regular season career-highs for the third year netminder. His 49 saves were also the most ever at PPL Canter and the second-most in Lehigh Valley Phantoms history. Connor Bunnaman set a new personal career-high and Phantoms season-high mark scoring goals in four straight games from January 13 - January 19. He also set a new career-best with a six game points streak, extending back to January 6. Bunnaman has notched 15 of his 18 points since December 7. The Phantoms earned the first home win of 2019 on Wednesday with a 3-1 victory over the Springfield Thunderbirds at PPL Center. Taylor Leier, Connor Bunnaman, and Mike Vecchione all scored for Lehigh Valley in their final meeting with Springfield this season. Lehigh Valley earned a point but fell to the Wolf Pack in overtime at the XL Center in Hartford. Colin McDonald and Mikhail Vorobyev both registered three point nights, and Justin Bailey tallied two points in his Phantoms debut. The Phantoms earned the two points on Saturday against Rochester, despite being doubled up on shots 25-51. Alex Lyon made a career-high 49 saves for the Phantoms and Mike Huntebrinker scored the shootout winner in his first AHL shootout attempt. The Phantoms went to overtime for the third game in a row, but eventually fell to the Penguins 2-1. Anthony Stolarz made 44 saves for Lehigh Valley and Mike Huntebrinker scored his first AHL goal in the third period. The Lehigh Valley Phantoms will take on the Hershey Bears for the 8th of 12 meetings between the two Keystone State rivals. 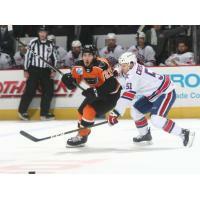 The Phantoms are currently 4-3 against the Bears this year, including 3-1 inside PPL Center. Hershey currently sits 7th in the Atlantic Division with 42 points, while Lehigh Valley sits 3rd with 49 points. 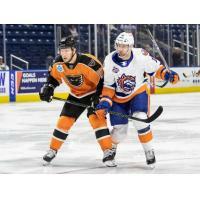 The Phantoms will head into the all-star break after a clash with the Bridgeport Sound Tigers in Connecticut. Lehigh Valley is 1-0-1 this season against the Sound Tigers with a victory in the home opener, and a shootout loss in Bridgeport. The Lehigh Valley Phantoms 2019 Bully Busters Unite Program made visits to Alburtis Elementary School in Alburtis, PA on Thursday, January 17 and Calypso Elementary school on Tuesday, January 22, 2019. The Phantoms' mascot, MeLVin visited with the kids and helped to teach them some helpful tips for dealing with situations of bullying.